NourishME is a naturally occurring whole food tonic containing many powerful ingredients. The Planets “First” Real Super Food! Today, more than ever, people are realising how NourishME can make a profound difference to their health and well-being. The benefit of NourishME extends into so many aspects of our daily lives and is something that can be appreciated by everyone who enjoys the feeling of a healthy body and relaxed state of mind. A healthy body works wonders on emotional conditions and on a physical level, can help chronic and acute health complaints and accidents where conventional means may not: fatigue, stress, sugar cravings, frequent coughs and colds, allergies, reflux, indigestion, insomnia, poor circulation, headaches, migraines and arthritis pain are just some of the examples of what can be dramatically improved by Good Health. 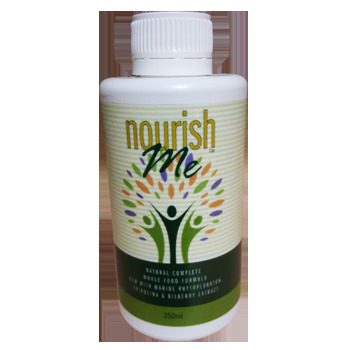 Some of the benefits of NourishME as a wholefood can be, enhanced general performance of the body’s organs and systems, renewed energy levels and optimised performance, vitality and better overall health. NourishME ™ with Marine Phytoplankton provides a unique blend of phytonutrients balanced with a natural composition of ionic sea minerals, berries and fruits. These phyto-nutrients are essential, natural, plant based extracts that promote proper metabolic functions. Many of them exhibit potentially promising benefits to the human physiology. These nutrients are helping to improve our mental function, memory, and protect us against the harmful effects of stress, feeding our brain, muscles, heart, arteries, joints, bones, skin, hair, hormones, immune system, vision, digestion, kidneys, spleen and liver so they can carry out their jobs more effectively. Active Ingredients: Organic Apple and White Grape Juice, Organic Bilberry Extract, Aloe Vera Juice, Morinda Citrifolia Juice, Olive Leaf Extract, Omega 3 & 6, Marine Phytoplankton, Australian Red Algae, Spirulina, Ionic Sea Minerals and Micro Nutrients, Organic Manuka Honey, Co-Enzymes 6,7,8,9,10, with Ginger, Rose and Frankincense Essential Oils. Directions: Serving size - 15mls daily. Shake well before use. Store in refrigerated place once open, can be added to juice, morning smoothie or taken on its own.